I have been training for the RNR USA Half Marathon for the past week or so but had not yet officially written out a training plan. Last night, I finally got it out of my head and onto paper. The long runs are the ones to stick to. In training for Baltimore, the only thing on my schedule that I stayed 100% committed to were the long training runs. I still ran and cross-trained on the days between but I was flexible depending on weeknight plans, tiredness, and whatever else might have encouraged me to shorten a run or push it back a day. Building up my mileage each weekend is what really prepared me to go out and dominate 13.1 long miles. Start speed training from the beginning. Last time around, I didn't decide on a goal time until a month out from the race, at which time I began to experiment with speedwork. As I've said before, my goal is just to PR which, barring any illness or injury, I am totally confident I can do. But, on race day, I know I'll want to go out as fast as I can. 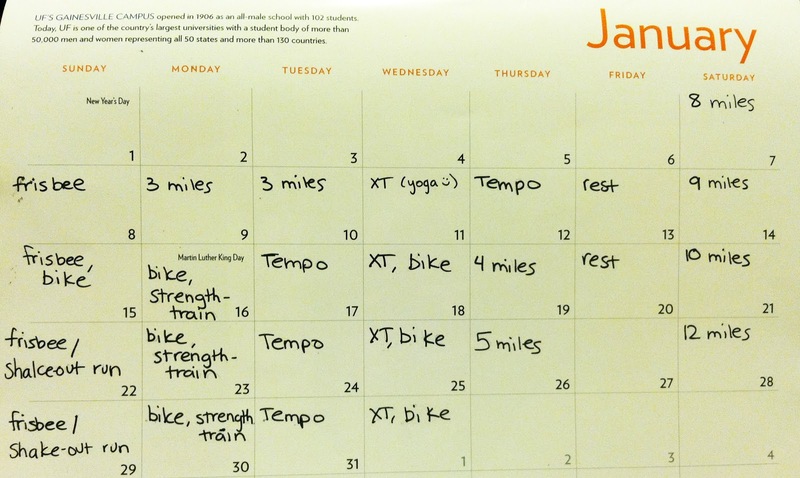 So the tempo runs on my plan are also important to stick to. If they don't always happen on Tempo Tuesday, that is ok.
Cycling is a very, very important part of this training plan. Not because it will make me a better runner, which I actually believe that it will, but because it will prepare me for April and May, when I amp up my training for a 3,000 mile ride. 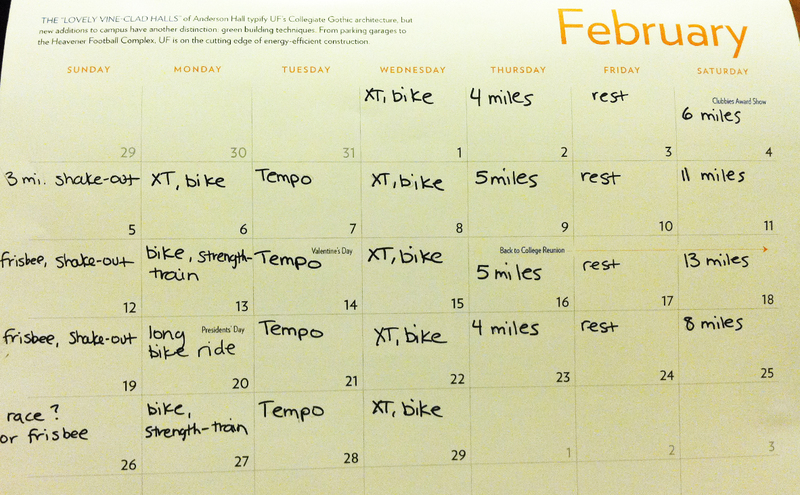 I believe in the importance of low-impact cross training (XT) so I have thrown at least two bike rides in there a week. Soon, I will have the ability to ride indoors so that will make life easy during these cold, dark months. Half Marathon training will not be my #1. My #1 will be planning a two-month bike trip across the country. If it's too hard to do both and I have to slack on one, I'm sorry to say it but I'll have to slack on running. Because that ride must be planned well so it can be executed well. There is no doubt in my mind that I can do both. There should be no slacking.